Vacant lots are quickly becoming a thing of the past in Bed-Stuy, where developers are snatching them up and building little residential projects. 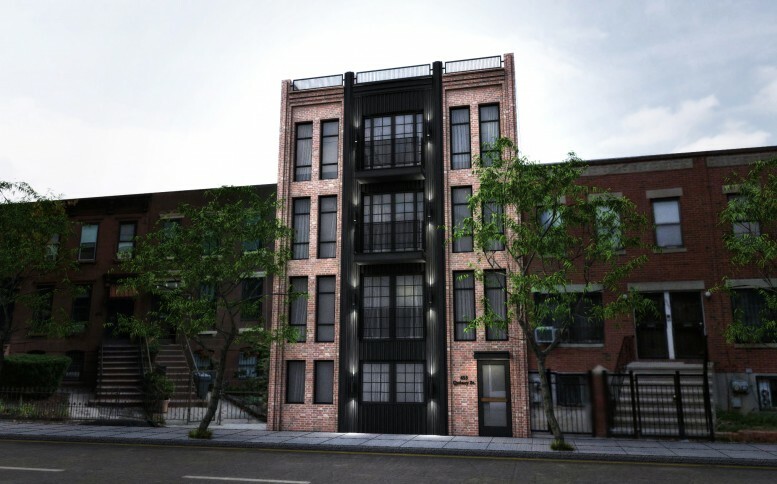 Today, YIMBY has the reveal for a four-story rental building under construction on one of those plots at 655 Quincy Street, between Stuyvesant Avenue and Malcolm X Boulevard. “We’re trying to build something more sensitive to the neighborhood,” explained Yiannos Vrousgos of Input Creative Studio, who’s responsible for the design. And the building does have narrow windows and a brick facade on the sides, much like its row house neighbors. Metal panels will clad the middle and give the structure a more a more modern vibe. A few apartments on the upper floors will have balconies and french doors, and future tenants will have access to a 225-square-foot shared roof deck. The finished development will hold nine units and 5,984 square feet of residential space. The first floor will have three apartments, and each of the upper levels will have two apartments. The units will break down into six three-bedrooms and three one-bedrooms. The little building is going up pretty quickly. Workers broke ground on the development in February, according to Vrousgos, and a steel structure has already risen on the 30-foot-wide lot. Construction is expected to wrap this summer. Borough Park-based Mayer Meisels is developing the building, and architect Barry Goldsmith applied for the permits last year. Meisels is not listed on the deeds, but the current owners picked up the 3,000-square-foot property for $950,000 last summer. 2 Comments on "Revealed: 655 Quincy Street, Bed-Stuy"
Keep dark with black-light on wall, haunting colors but all right. Kinda nice, why not a slightly darker brick on the inside instead of the gloomy black? Otherwise it shows respect for the surrounding buildings….!! !